PureSleep is an FDA-approved dental device that is designed to reduce or eliminate snoring. It was invented in 1995 by Dr. Douglas Fenton, a San Francisco dentist, as an easy-to-use device that is simple to customize for fit. When a person falls asleep, the muscles at the back of the throat relax. These muscles can block the area behind the tongue, commonly called the upper airway. When a person breathes, the soft tissue in the upper airway vibrates. This vibration causes the sound that is associated with snoring. When the PureSleep device is inserted in the mouth, it holds the lower jaw slightly forward from its normal position. Sleeping with the jaw in this forward position helps widen the upper airway. With the wider airway, air can move through the airway without being obstructed and without causing the vibrations that cause the snoring. Dentists have been using PureSleep for years, making a mold and customizing the product while the patient sits in the dental chair. The PureSleep Company now makes the PureSleep product available online. You can customize your fit by boiling it in water. 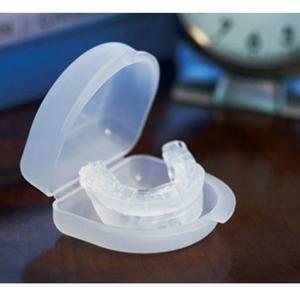 It will adhere to your teeth, providing you with a custom fit. Assemble the two pieces of the device using the plastic pins. Warm the device in boiling hot water for one minute. Wait 10 to 12 seconds for the device to cool. Bite down hard to make an impression of your teeth in the softened plastic. Continue to bite down for 30 seconds. Remove the device from your mouth and place it under cool, running water. If the device does not fit correctly after cooling, the device can be refitted three to four more times. Will PureSleep Work for You? Additionally, this devise is not appropriate for people who have been diagnosed with central sleep apnea. The device can be used with obstructive sleep apnea, but it does not treat obstructive sleep apnea. Purchasers need to complete a 19-question questionnaire on the company's website prior to purchase. The questions are designed to identify if the purchaser has any of the health or dental issues listed above which preclude use of the device. The product can be purchased online for about $60 plus shipping. While the product is not to be used for the treatment of sleep apneas, some people have reported that they are able to use the Pure Sleep device in substitution for their sleep apnea machine. However, you should check with your doctor before you modify your treatment program. The Living with Sleep Apnea website features topics and discussions on sleep apnea, sleep disorders and sleep products. In the highlighted thread, users seemed to find the mandibular readjustment portion of the PureSleep product to be comfortable and effective (including some patients with sleep apnea). Common complaints included dry mouth in the morning. Discussion at CPAP Talk suggests that the users debate the research and reviews in order to form a well-rounded and grounded opinion. Some users cite that it's not for use with moderate or severe apnea and the device is not intended to treat any disease. Others liken it to the dental products available, but are not sure if it will be as effective as the dental version. Some users with mild sleep apnea report that Pure Sleep works really well for them. The Ripoff Report contains reviews from a few dissatisfied customers. One woman reports she is suing PureSleep. Since she used the device for snoring, she has pain in her jaw and migraines. She claims she did not have these conditions prior to using the device. One other person reports jaw pain after using the device, and had trouble getting a refund. The one positive review on the Ripoff Report was from a woman who suffers from severe sleep apnea, so much so, choking in her sleep was a concern. She also could not tolerate wearing a CPAP mask. She stated she only has a soft, mild snore and no longer chokes in her sleep. The PureSleep website includes many testimonials from satisfied customers. However, the device does not provide all users with the same results. If it doesn't stop the snoring of the user, it can be returned and the purchase price refunded.